Bar Code Generator for Excel is an Excel Add-in that draws formula based bar codes into Excel worksheets as independent Excel shape images. 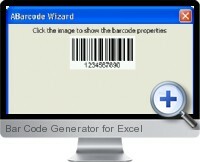 Bar Code Generator for Excel works for versions of Excel 97 or higher. Available symbol formats are: Code 128; Code 39; Extended Code 39; EAN-8; EAN-13; UCC/EAN-128; ITF (Interleaved Two of Five); Postnet; UPC-A; and UPC-E. Fixed if you enter the value directly into the formula. The bar code will always be the same, unless you edit the value. Variable if you enter a reference to another cell into the formula. The bar code is automatically updated to the value of the referenced cell. Bar codes are drawn as Excel shapes, thus making them portable. The generated bar codes remain within the worksheet, so they are available even if you open the worksheet on a computer that does not have Bar Code Generator for Excel. Bar code shapes can be easily manipulated, for example, by changing its size and orientation, moving to another position, as well as copying and pasting to another worksheet. Position: reference to a cell or range of cells. If missing, position of the calling cell is assumed. Width: sets the width of the bar code symbol in points. If missing, width of the Position parameter cell (or range) is assumed. Height: sets the height of the bar code symbol in points. If missing, height of the Position parameter cell (or range) is assumed. Rotation: sets the orientation of the bar code symbol, from 0 to 360 degrees. Default is zero. The function returns a unique ID that references the shape, so that the symbol can be redrawn as needed.